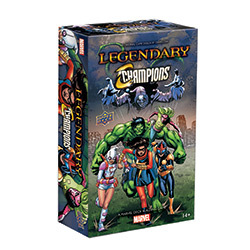 Upper Deck is bringing the characters and themes of the new Champions comic book series to the Marvel: Legendary Deck Building Game in a new expansion set releasing in February. Legendary: Champions draws on the comic series that launched late last year about young heroes fed up with the older generation of heroes because of the events in the Civil War II storyline (see �The Marvel Universe Welcomes �Champions��). The new expansion is built around the heroes of the Champions comic, including Gwenpool, Viv Vision, and Nova. The themes of the comic, which focuses on less violent ways of dealing with problems and the importance of protecting the public, are presented in the game through a new mechanic and the return of a popular old mechanic. The new �Cheering Crowds� ability allows a player to use a Bystander they rescued earlier in the game to re-use a hero card a second time. The �Versatile� ability, appearing in the game for the first time since Legendary: Dark City, offering players a variety of options when using characters with this ability. Legendary: Champions includes 5 new heroes, 2 new villain groups, and 2 new Masterminds for the game. As an expansion, a copy of the Legendary Marvel core set is needed to play. MSRP is $19.99.